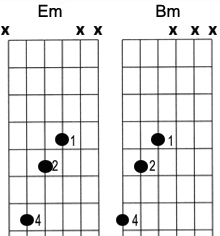 Two very basic chords - however if you play the "normal" E minor and B minor shapes it doesn't sound quite right. These shapes give you the right voicings and with practice are easy to play. This piece has a 5/4 time signature.